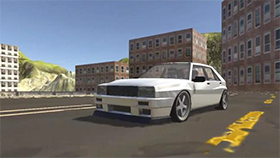 Street Pursuit is a racing game created by Happylander.com. This game has simple gameplay, suitable for all ages, especially those who like racing games. You can experience this game on your browser because it is a flash game. This game has 8 levels and each level is a big challenge for you. At the start of the game you can only play at level 1. You need to complete level 1 and earn $ 150 to unlock level 2. The remaining levels are similar. In level 1, you control a car and your task is to collect as much money as you can. The money will appear randomly on the map. You have 1 minute to collect money in this level. Your enemy will be the police car. Each time you touch a police car, money goes out and you need to collect them again. Use left and right arrow key to control the car.